Today we are going to talk about angels. Where have you heard of angels before? What do you think they look like? 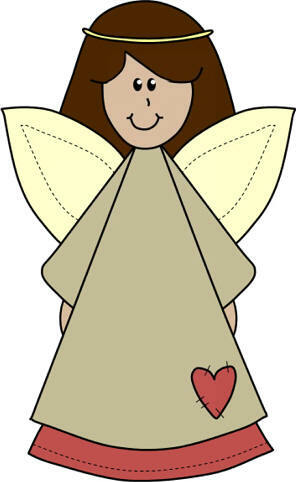 Hopefully by the end of today's class you will know more about angels and why they are here to help us. The most important thing to know about angels is that God made them. He sends angels to help and deliver messages to us. The word angel actually means God's messenger. Some of the angels in the Bible that sent messages are: the angels that announced Jesus birth, they were at the tomb to tell Mary and Martha that Jesus was alive, and the angel, Gabriel, that told Mary she would have a son. There are many more places where angels gave messages but these stories you probably know the best. Angels also protect us when we're in trouble. Remember Daniel in the Lion's Den? An angel came and shut the mouths of the lions. What about Shadrach, Meshach, and Abednego? An angel was standing with them in the fiery furnace to keep them safe. So you can see angels are important, but they're not more important than God, they serve God. Angels are actually like us in some ways. Angels can chose to follow God or not. Most of the angels chose to follow God and work for him and some of the angels went to work for the devil instead. It's good to know there is a devil, just because he sometimes tries to trick us into thinking that bad things are fun or good. Keep in mind, God and his angels are much more powerful than the devil, after all the devil was an angel, but he began to think he was better than God. So God sent him out of heaven. Angels are also like us because they worship God, but they do this continually, that means they never stop. In Revelation 4:8 (NIV) it says, "Each of the four living creatures had six wings and was covered with eyes all around, even under his wings. Day and night they never stop saying: 'Holy, holy, holy is the Lord God Almighty, who was, and is, and is to come.'" Another way angels are like us, is that they don't know everything God knows. The Bible says that not even the angels know when he is going to come and take us to heaven (Matt.24:36). Angels are very different than us in some ways too. They live in heaven with God so they certainly know more about God than we do, and just being in God's presence probably gives them the special glow or brightness they seem to have. Angels can be visible and invisible. They were seen at Jesus tomb and in the sky to the shepherds, but they can be invisible too helping us when we don't even know it. The Bible also says that angels never die in Luke 20:36. So you can see that angels are a little higher than us, but lower than God. God is very strict in saying that we should not worship angels or see them as more important than him. Remember that God made angels and He is the only one we should pray to, but its certainly okay to thank God for angels and to pray for them if you want. You might wonder what angels look like. Well, there is no clear answer to this. When people saw angels in Bible times they were often afraid at first (imagine if you saw an angel all of a sudden). I think its okay to imagine angels as friendly, beautiful creatures that help us. Some people like to believe that we each have our own guardian angel, an angel that watches and takes care of us at all times. While we do know that there are many angels, the Bible says there are, "thousand upon thousands, and ten thousand times ten thousand" (Rev. 5:11, NIV). The Bible doesn't seem to say anywhere that we each have a guardian angel. If you think about it, we don't need a guardian angel, angels can't be everywhere and know everything like God, and He is always with us. There are also different ranks of angels, or they have different jobs. Some of the angels talked about in the Bible are Michael an archangel which means the prince of angels, and Gabriel is another angel named in the Bible and he was the angel that told Mary she would have a baby and to name him Jesus. Angels also have been mentioned in different groups. Some are called chief princes, cherubim or seraphim. They all seem to be important to God and all seem to have specific duties that they do. One of the best things about angels is that whenever someone becomes a Christian they sing and rejoice, in other words they have a big party! One day we can look forward to singing to God with the angels someday in heaven. So you see, angels are important and they're very real. God uses them to give us messages, to help and encourage us, and they will announce his second coming.